Yes, you read correctly. 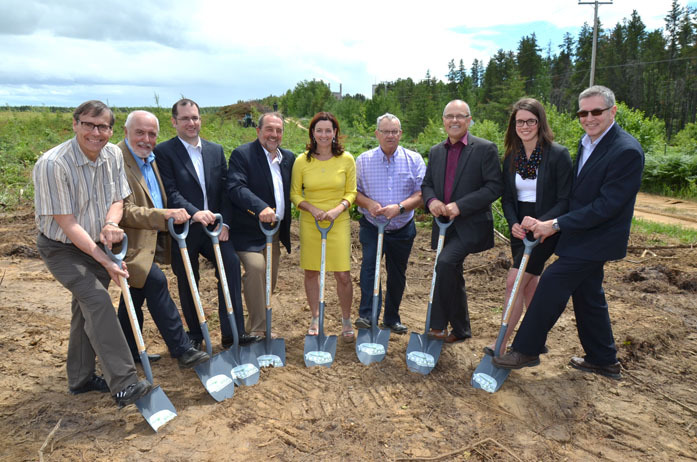 Resolute has teamed up with local investors in the Lac-Saint-Jean region of Quebec to build “Les Serres Toundra”, a 35-hectare greenhouse complex on land adjacent to our Saint-Félicien pulp mill. The real winners will be Quebec consumers – starting next year, they’ll be able to buy locally-grown, pesticide-free cucumbers and other vegetables at good prices from grocery chain Sobey’s all year round – and with a lower environmental footprint. Les Serres Toundra will be the biggest greenhouse ever built in Quebec, and the first greenhouse in Quebec to grow cucumbers all year round. From left to right: Richard Garneau – President and CEO of Resolute, Gilles Potvin – Mayor of St-Félicien, Éric Dubé – President of Serres Toundra, Denis Lebel – Minister of Infrastructure, Communities and Intergovernmental Affairs and Minister of the Economic Development Agency of Canada for the Regions of Quebec, Caroline Fradet – Senior Vice President of Serres Toundra, Bertrand Fradet – Vice President of Serres Toundra, Yvan Ouellet – Sobey’s Québec, Vanessa Guy – Political staffer of Premier Philippe Couillard and Marc Desbiens – IGA Saint-Félicien. Building is underway right now, and the first cucumbers will be harvested in September 2015. Over the next five years, this innovative project will provide jobs for 400 people. Now that’s a win-win situation!